In the music business, timing can often be crucial, so for a band who only had two releases between greatest hits albums, and has recently reissued all of their previous discs, this may not exactly be the best time for their first live disc. For a band like Motley Crue, whose live show is about more than the music, a live disc can also be a bit of a drawback, because you're not really getting the full picture. Having said that, Live : Entertainment or Death is a well-produced, strong sounding disc that does a decent job of covering the band's hit-era portion of their career, taking me to another high point of the disc. 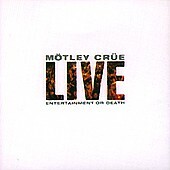 Instead of pulling everything from recently recorded shows, many of these cuts were taken from shows recorded when the songs were new, so when you're hearing early cuts like "Live Wire", "Public Enemy #1" and "Merry-Go-Round" from Too Fast For Love (still my favorite Motley Crue album) you can hear the raw edge of this new at that time band. With improvisation beyond the usual stage banter at a minimum, this is largely a greatest hits collection recorded live, but still makes a welcome addition to any fans collection.